With the much-anticipated NBA season kicking off the day before Halloween, the BAIT lifestyle brand will team up with CoolRain and MINDstyle for a supernatural spin on the popular series of collectible NBA figures. The CoolRain x NBA Glow in the Dark Collecitble Set by MINDstyle is a BAIT-exclusive designed to celebrate both the start of the intriguing new season and the spirit of Halloween. The limited set features six All-Star figures with luminous glow-in-the-dark bodies for a spooky, eye-catching touch. 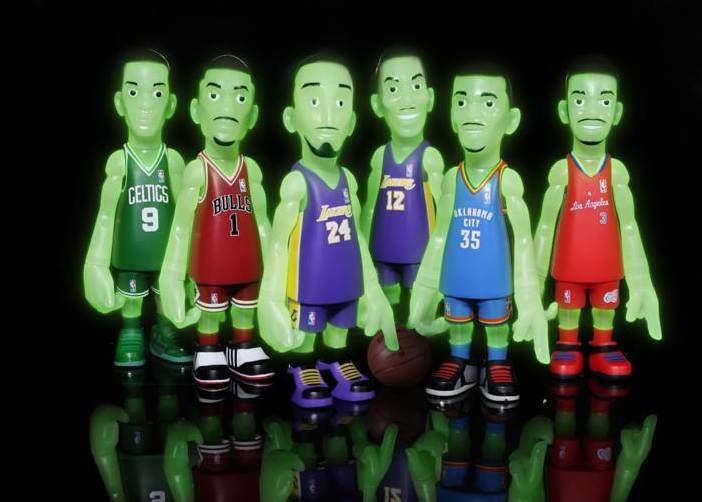 The set features glow-in-the-dark versions of six bright NBA stars: Kobe Bryant, Derrick Rose, Dwight Howard (in his new Los Angeles Lakers jersey), Kevin Durant, Rajon Rondo, and Chris Paul. The latter four won’t see a general release until the launch of the CoolRain x NBA Series 2 by MINDstyle in a few weeks, meaning the Halloween-themed set is the first chance for collectors to grab those figures. The CoolRain x NBA Glow in the Dark Collectible Set is limited to 1000 sets, which will be available exclusively at the BAIT retail store in Diamond Bar, CA, and at BAITme.com, on October 30th – NBA’s Opening Day – for $99.99. The Coolrain x NBA Collectible Series 2 will see a general release later in the fall, featuring players like Durant, Rondo, Paul, Howard, Lebron James, Jeremy Lin, Blake Griffin, and Pau Gasol offered in blind boxes and wearing their away jerseys. A special run of BAIT-exclusive blind boxes will feature variations of these players wearing their home jerseys instead.